For my review of the novel, click here. Jacob's grandfather told strange fantastical tales. When he died under mysterious circumstances, Jacob went to his home island to try to solve the mystery of his grandfather's tall stories. There he meets a different group of people who have plenty to tell him about his grandfather's life and his grandfather's stories. It's sort of hard to review this because it's the same story just with illustrations and less elaborateness. For its briefness, I like it a bit less than the actual novel. 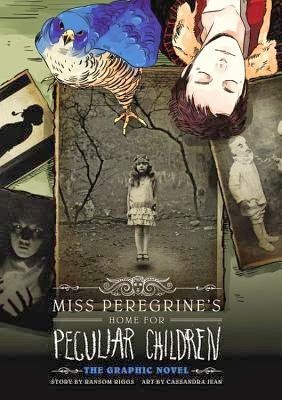 This would be a great read right before you read Hollow City, that way you can refresh your memory of the story without having to reread the whole novel. The illustrations were pretty fab and they gave a different feel to the story. I wouldn't have minded if they were a bit creepier or stranger, but they were pretty good. We learned less about the characters in this which is a bit disappointing, because I really enjoyed knowing more about each of them. It was a good, quick read though and it was nice to see this great novel take on a different format. Now I will just eagerly await Hollow City. "Growing up, Grandpa Portman was the most fascinating person I knew, and I begged him to regale me with stories whenever I saw him."